Home Date Interview Questions Medium Date Questions How to change Time Zone in Java? Write a program in Java that changes Time Zone of current date . This problem can also be asked as following. Here first we have to convert String to Date and remaining program will be same as below. For changing time zone of date we have to use below method of DateFormat class that is present in java.text. * package. Here we are changing date in IST to GMT and EST. How to get Time Zone information ? * @problem How to change Time Zone? // Getting London time zone. // Setting London time zone. // Getting Newyork time zone. // Setting Newyork time zone. 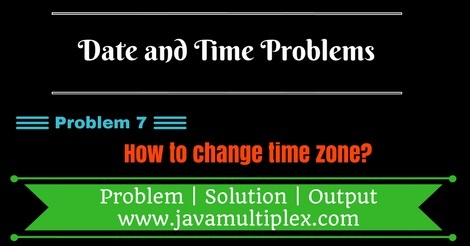 Output - How to change time zone in Java? Tags : Date and Time problems, Change Timezone in Java, String, DateFormat, SimpleDateFormat.